Eat, Explore & Enjoy: 1 Week! Last night, I got to see Twilight Breaking Dawn: Part 1 with some co-workers and I really enjoyed it! I think it's up there as one of my favorite movies of the series. Initially I wasn't sure about breaking the 4th book into two movies, but after seeing it, I'm glad they did since it seemed like time was spent on the areas I would've hoped from reading the book. I'm over 3/4 the way through the 4th book now (it's 754 pages- the longest book I've ever read!) and am hoping to finish it on our drive to MN next week! That's right, I'm moving up there next week and I'm so ready to see my hubby! I'm sad to leave my parents, my job, my co-workers, and Texas, but am ready for what the next chapter of life holds. I couldn't tell which photo I liked better, this one is cross-processed (I love that vintage look!). 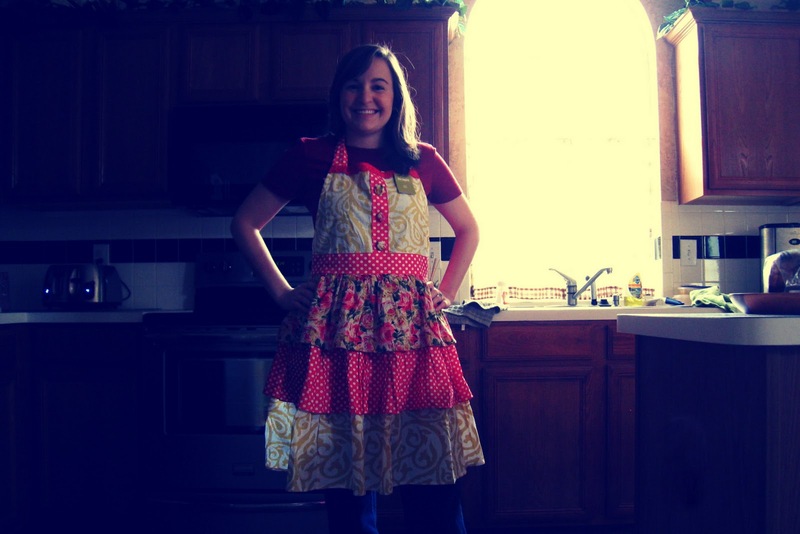 But this one shows the more true colors of the apron. This is another Pier 1 purchase from last month. I'm so excited about it, I'm thinking it'd be cute in the kitchen next to the sink with flowers in it. It's cute just by itself too, or maybe with some fake lemons or something - any other ideas for it? It was $2.98 and we all know I love a good bargain. In other HUGE news, Iowa State beat Oklahoma State (#2) last night and it was amazing to say the least! It's the highest ranked team we've beaten in school history and we were their first loss of the season! It's crazy really and such a great day to be a Cyclone!! In the coming weeks, I'm hoping to put together a post with job search/interview prep tips that I've been learning through my job search. I'll also see if you have anything to add to help the many people out there looking for jobs right now.